I use this hand and nail cream every night before I go to sleep, on the recommendation of beauty guru Lisa Eldridge. I am very fair skinned and live in Australia, so it's hard to keep my hands in good condition. 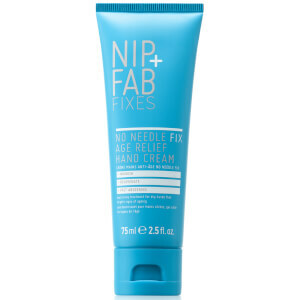 This cream does a great job at keeping your hands soft and supple, despite the ravages of Sun, eater and age (I'm 57). I'd highly recommend you try it, and the duo pack is great value! The best hand creme ever!! !, I'm very thankful for the tester as it prompted me to purchase the full size duo at a discount, thank you Caudalie. I will most certainly recommend Caudalie to my girlfriends to get them on it too!!! This is my favorite hand cream. It's high moisture, but not greasy and smells very good. This is one of my favourite hand creams, and I go through quite a few thanks to chronically dry hands! I put this on my hands every night so being able to buy a double pack is excellent value. I purchased a number of hand creams in light of a recent discovery that an ingredient in many products called dimethicone and similar is a polymer silicone which although creates a feeling of silky smoothness is actually drying your skin and creating a viscous cycle. I purchased Skin Food and Pomegranate hand cream by Weleda, Zkin soothing hand cream, Ruby Red restoring moisturiser, Oskia renaissance hand cream and Caudalie hand and nail cream. Both Weleda products are excellent. great aroma and feel. a little goes a long way. the skin food is suitable for many applications however can be quite thick (very lanoliny, 2nd ingredient). Caudalie is very very good and i will be buying this again. great ingredients, aroma and feel. Zkin is a great Australian product and is in a pump action so you never over squeeze and use too much. great smell, feel and ingredients, and ticks many ethical boxes. Ruby Red i am not too sure about yet, but still ticks alot of boxes and does feel good. the product i won't be getting again and would prefer to regift than to use is the Oskia cream. Scent is very old lady smell (sorry if i offend anyone but way too strong and too much rose). Too many ingredients and it was the most expensive also. I hope this helps also. BTW avoid octabenzone and octinoxate in lip balms - it is a polymer used as a UV filter but has been found to be absorbed into the body (blood, urine and breast milk) and is petroleum derived and makes your lips dryer the more you use. Another con. All the best. I am very satisfied with Caudalie hand and nail cream. It makes soft skin, absorbs very quickly, makes no greasy marks anywhere you touch and seems to strengthen the nails. I suffered from easily broken and split fingernails. I don’t have this problem anymore after I used the cream for about four month. I was pleased to find a "normal" hand cream that works well and does not contain methyl paraben, aloe, or xanthan gum, all of which cause severe dermatitis on my hands.